Ryan Gosling is playing the teacher and Halle Berry is the principal. Beyond that, the story, the casting and pretty much everything else for the movie is up for discussion. This is how CSUN alumnus Bradley Upshaw ’88 (Credential) envisions the movie about his life. Is it far-fetched to believe he’d be the subject of a feature film? After all, the last teacher like Upshaw was Jaime Escalante and the 1988 film Stand and Deliver was about him. In March, Upshaw, a third-grade teacher with 33 years of service at Vanalden Avenue Elementary School, was surprised at a school assembly where it was announced that he had been selected for the National Teachers Hall of Fame. 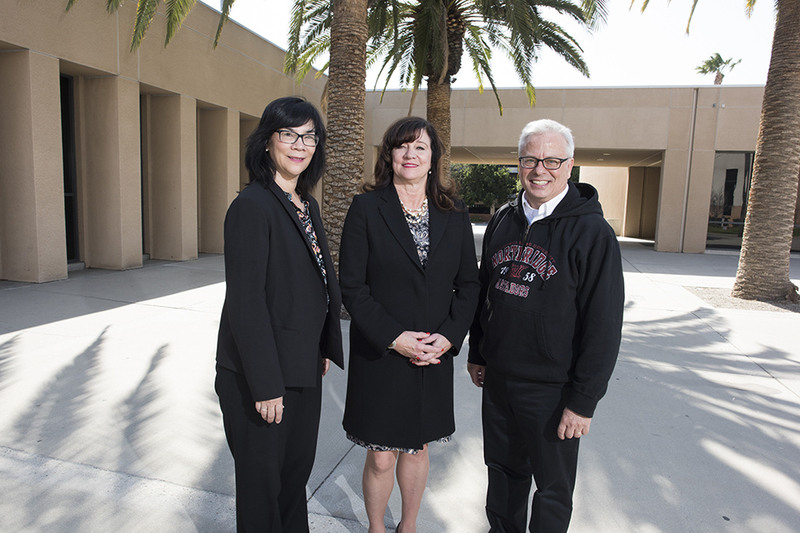 Bradley is one of two teachers from the Los Angeles Unified School District to be chosen for induction — the other being Escalante, a legendary math teacher who taught at Garfield High School. Teachers are nominated through the Hall of Fame’s website. Only five teachers nationwide are chosen for induction annually and are selected by a national selection committee. Vanalden Principal Yoshim Yang nominated Upshaw for the honor. On the nomination form, Yang wrote about how Upshaw visited with the family of a student who had bone cancer. Due to the illness, the family wanted to withdraw him from Vanalden Avenue Elementary and home-school him. Upshaw convinced the family that their child would not only receive passionate education from him, but that he would also receive comfort. The family ultimately decided to keep their son at Vanalden. Originally from Anaheim, Upshaw often moved around as a youth. It was his intent to become an actor that led to his return to Southern California at San Diego State for undergraduate studies. He earned a bachelor’s degree in Theatre Arts, and continued his pursuit of acting as a career into his mid-20s. He made his way north to Los Angeles to break into showbiz, but couldn’t catch the break. A friend of his told him of a company that serviced children with special needs. Upshaw took a job with the company and realized the work he was doing was gratifying. It was suggested to him that since he already had a bachelor’s degree, he could get hired as a substitute teacher in LAUSD and still go on auditions. Teaching spoke to him more and more, though. In teaching, he could satisfy his inner passions. His mother Doris instilled compassion in him, he said. His father, Douglas, instilled a work ethic in him. Upshaw loved to perform. By teaching, he could be compassionate, work hard and perform every day. 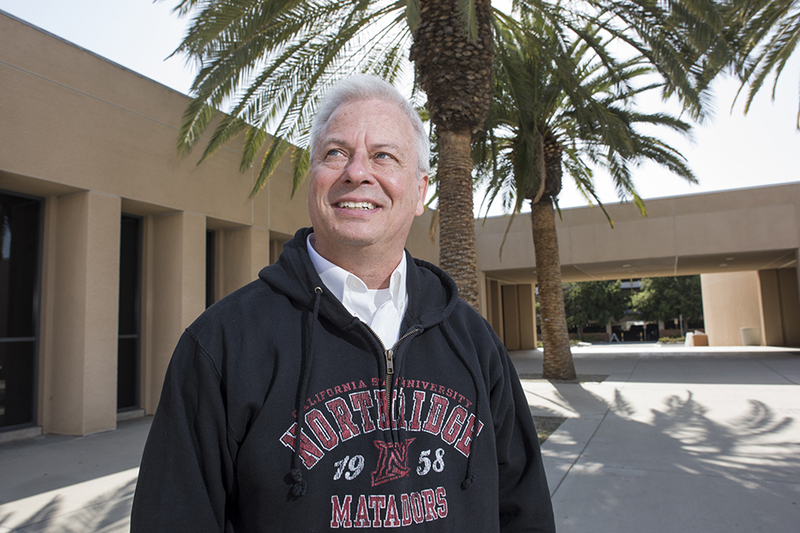 He enrolled at CSUN to pursue a teaching credential. After earning his credential, Upshaw took root at Vanalden. And from the very beginning, his teaching style was effervescent. And it was also tender-hearted. Upshaw said he had terrible problems with math and reading as a child. He recalled one school year where his issues in and out of the classroom caused him to miss 60 days. Because of his own experiences, he has much empathy for students and their everyday challenges. He sees his role not only as a teacher, but also as a friend. He tries to have his students sit around in a circle once a week and share their concerns, feelings and successes. He has found it as a way for him to get to know his students, but also for the kids to identify with and find empathy for their fellow classmates. For nearly three decades, he has had a class mascot — a plush-toy mouse named Gretchen — that he has used as a communication tool for children. “I introduce her during the first week of school and tell the kids, ‘I have a very good friend of mine. She’s going to arrive.’ I keep looking out the door for her to arrive,” Upshaw said. When he finally introduces Gretchen, some of the kids are disappointed because it’s not a human. But he goes back to his theater days and asks the children to suspend their disbelief. Upshaw said most of his students warm up to Gretchen and treat her like a human. He has a program called Gretchen’s Notebook where students can leave a note about whatever’s on their mind to the mascot. Upshaw reads the notes privately and responds in a note as Gretchen, usually leaving the response in their desk. The notes can be happy, sometimes tragic. They always give Upshaw a better perspective of the individual. In turn, he puts more passion and compassion in his teaching. Yang said as much as the students affect Upshaw, the new Hall of Famer is affecting his fellow teachers and staff. The National Teacher’s Hall of Fame ceremony will be June 22. Upshaw will have his own exhibit at Emporia State University for a year. It’s also the site where Upshaw envisions the last scene of his movie would be. He’d be in the audience watching as one of his former students is inducted into the Hall of Fame. The working title for this film, as of now, is Dragonfly Days.